At the IMF/World Bank spring meetings in Washington a week ago, downside risks to the Chinese economy were discussed solemnly, but calmly. There was no mood of crisis, no feeling that a major dislocation in the economy or the financial sector was imminent. Meanwhile, the surge in Chinese equity prices so far this year hardly seems to indicate an impending recession. Yet there are signs of trouble ahead. Real interest rates and the real exchange rate have both been rising at a time when the domestic credit market is under stress. Deflation has taken hold in the real estate sector and in the over-supplied heavy manufacturing sector, where much of the troubled debt is to be found. And the most recent quarter has seen GDP growth dipping to its lowest level since the global financial shock. It is becoming apparent that a much larger easing in policy might be needed to head off a hard landing. Fortunately, this is now clearly underway. The underlying growth rate in the economy has now been slowing for many years as economic rebalancing takes effect. In the Fulcrum model for economic activity, the long run growth rate is estimated to have slowed gradually from 11.5 per cent in 2007 to 6.5 per cent now. This decline has been both inevitable and, to a large extent, desirable. Until recently, the model indicated that the actual growth rate in activity was tracking the underlying slowdown fairly closely. Although there has been much discussion about hard landing risks whenever quarterly GDP growth has dipped in recent years, this was never confirmed by our activity model. However, the very weak industrial production data for March 2015, alongside declines in survey data, retail sales and investment, has resulted in a drop in estimated activity growth to only 5.2 per cent. 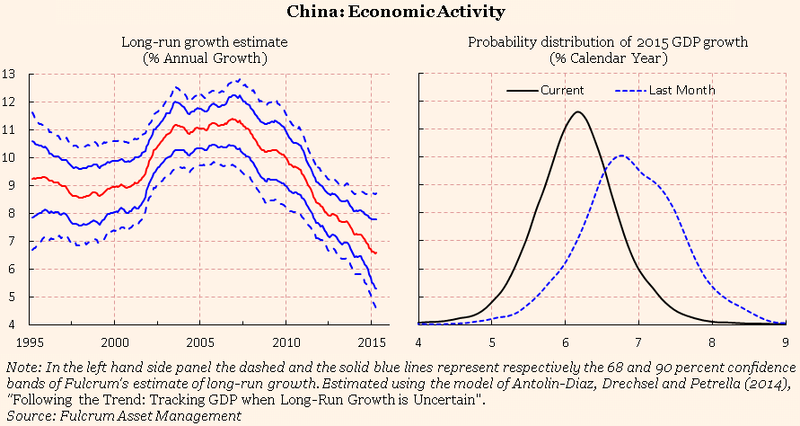 As the graph below on the right shows, the model’s probability distribution for GDP growth in the 2015 calendar year has shifted markedly downwards, with a much increased statistical risk of a sub 6 per cent outcome – one definition of a hard landing in the Chinese context. Of course it would be wrong to place too much emphasis on one month’s data. But there are some underlying reasons for more concern than has been justified in the temporary weak patches for activity in the past couple of years. Domestic demand has clearly been slowing as monetary conditions have tightened. Real interest rates have remained high, or have actually gone up, as deflation has taken hold in house prices and producer prices. Monetary growth has weakened, though up to now this has been largely because of an intended squeeze on the shadow banking sector. There are two main routes through which the slowdown could develop into something much worse. The first is that the uneasy stability in the savings/investment relationship could change. Martin Wolf warns that investment could slow sharply in a decelerating economy. Alternatively, there could be a rise in household savings in response to concerns about falling housing wealth, which is what happened during the US housing crash. Given the bubble-like surge in equity prices, this may seem improbable, but it would become more likely if the equity surge ends in a crash. 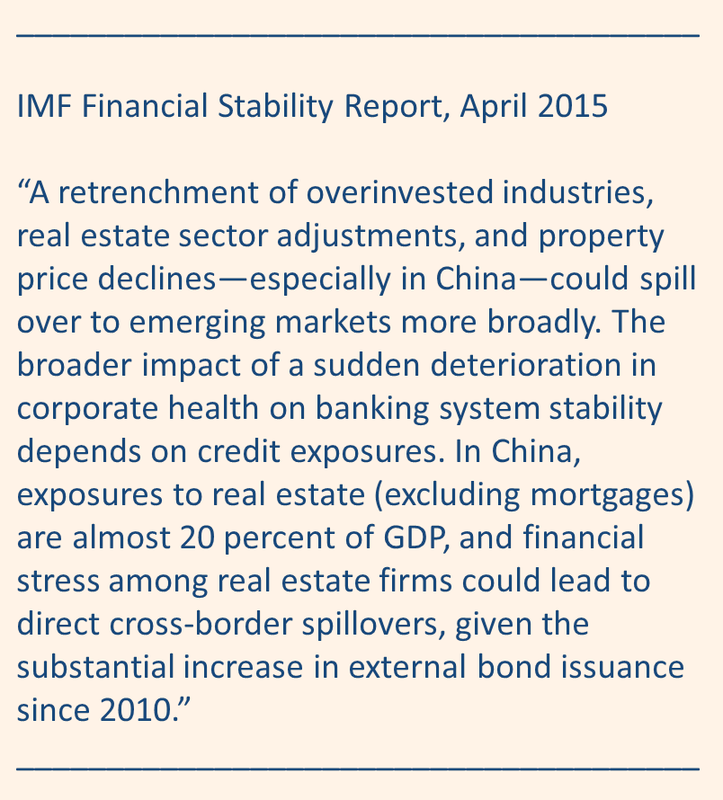 The second route, also reminiscent of events in the US in the last decade, would be a financial crash led by stressed loans to the real estate or manufacturing sectors. Last week, there were defaults by a property developer and a power equipment manufacturer, though many observers saw this as a deliberate and controlled decision by the authorities to inject some discipline into the credit markets. It is widely believed by investors that these stresses can be brought under control, though that is also what was believed about the Federal Reserve in 2008. Until now, the monetary authorities have been disinclined to react aggressively to signs of economic weakening and financial stress, seeing them as part of the solution rather than part of the problem. There has been no precipitous reduction in interest rates, no panic cuts in reserve requirement ratios (RRRs) and, crucially, no apparent desire to weaken the exchange rate. In other words, China has been the only major country to stand aside from the global pattern of unconventional monetary easing. The one percentage point cut in the RRR announced last week was larger than expected, and is clearly intended to hold down money market rates at a time when large scale capital outflows are tightening monetary conditions, and tending to reduce the PBOC balance sheet. It will “free” about RMB 1.3 trn of bank reserves for other uses. However, market rates still remain positive in real terms, and may need to be reduced further. It has been reported that the PBOC is contemplating a programme of unconventional monetary easing similar to the LTRO measures undertaken by the ECB in recent years, with elements of the UK’s Funding for Lending Scheme thrown in. This will be aimed at easing the overhang of local government debt, which is being rolled into longer durations via new “municipal” bond issues. Bonds acquired by the banking sector in this process will be allowed to be used as collateral for low interest short term liquidity provision by the central bank, as will other packages of approved new lending by banks. This should be seen as a form of targeted quantitative easing that indirectly finances public debt by expanding the central bank balance sheet. Although similar to a package announced in July 2014 to help small firms, this initiative could become much larger, since the problem of non performing local government debt is potentially massive. The authorities clearly intend to use the policy banks as an avenue for pseudo-fiscal expansion. Last week, it was reported that they will announce a capital injection of $63 bn into these entities from the foreign exchange reserves, presumably with the intention of enabling them to raise more finance to boost lending on infrastructure, agricultural projects and trade support. President Xi’s ambitious promise of a new silk road – one belt, one road – is becoming a reality. The story of the deflation of China’s credit mountain will be a book of many chapters. In the next chapter, we will learn whether the authorities have acted in time to correct the first genuine downturn in economic activity since 2008. The odds are in their favour, this time. LONDON – It is annual general meeting season – the time of year when some of the world’s biggest companies gather to report to shareholders and have some semblance of a conversation with them. For the next couple of months, a succession of companies will talk about what influenced their performance over the previous year, what they are planning for the future, and the decisions that their boards have made. There was a time when these meetings took place without much fanfare, mostly unnoticed by the public. That has not been true for a couple of years. A worsening economy and widening inequality have spurred more people to become more engaged and take an interest in the activities of companies and those who run them. And, with that change, attention has broadened from CEOs and executive teams to those who previously existed in a black box: the companies’ board members. In 2012, shareholders and others started shining a bright light on boards, questioning their decisions and activities, and those of individual members, and thus was born the Shareholder Spring. People grew tired of tone-deaf board directors operating in soundproof rooms, seemingly ignoring economic realities and the public’s mood. They wanted to confront those who decide on executives’ often eye-popping compensation or approve companies’ decisions to undertake sophisticated tax engineering. People wanted to know whether board members were actually doing their jobs or just filling seats and collecting a nice fee. Many companies and company boards hoped that this heightened interest would pass quickly; instead, it has matured. Discontent has continued to mount, and investors, employees, politicians, and members of the public now want to know not only about executive compensation, but also about the frequently staggering discrepancy between what companies’ highest- and lowest-paid personnel earn. They want to know about living wages and zero-hours contracts. They want to know what companies are doing to address climate change, whether they are responsible community members, how they behave in conflict zones, and much more. Those asking the questions are no longer content to protest outside. They are becoming increasingly sophisticated about how to be heard, buying shares, stepping up to the microphone, and looking board members in the eye, so that their questions become part of the official minutes. And they are putting pressure on companies’ major investors to hold board members to account as well. The questions posed and statements made can sometimes be longwinded. But many of them are legitimate, and they are an important reminder to boards that they must serve the company’s entire ecosystem – investors, employees, customers, and community alike. Indeed, these open meetings are a reminder that board members must ask the hard questions all year round, rather than simply rubber-stamping management proposals or going along to get along. Interestingly, just as the movement to hold boards to account has gained greater traction, some companies have adopted new ways of convening annual shareholder meetings. These were once fairly staid gatherings. The companies’ senior management would walk investors and board members through the reporting formalities step by step, present results, take questions, vote, and move on. There was tea, coffee, and biscuits, but nothing fancy. In recent years, however, there has been a trend toward a more carnival-like atmosphere, with companies bringing in big-name entertainers and turning the event into a feel-good pep rally. Last year, Wal-Mart’s annual meeting featured Harry Connick, Jr., Robin Thicke, and Pharrell Williams. In 2013, Elton John performed. In contrast, other companies have swung to the opposite extreme and embraced fully virtual meetings. The board gathers in front of a camera for a live webcast to shareholders, takes questions submitted in advance, and avoids the protesters altogether. This year, HP joined Sprint and Martha Stewart Living Omnimedia down this road. There is a virtue to having a meeting with a virtual component: businesses are global, and so are their investors, who can participate without having to get on a plane. But a webcast of a meeting with a live audience would be the ideal combination. And while companies might argue that entirely virtual meetings save money – which of course is true – investors do not need Robin Thicke. They will settle for good numbers, serious discussion, and a dry biscuit. Boards and managers must take these meetings seriously. Part of the job is facing those with something at stake. Hosting circuses or hiding behind cameras will not keep tough questions from coming. A seat at the boardroom table comes with the responsibility to stand up and do this vital part of the job – in person and without musical accompaniment. 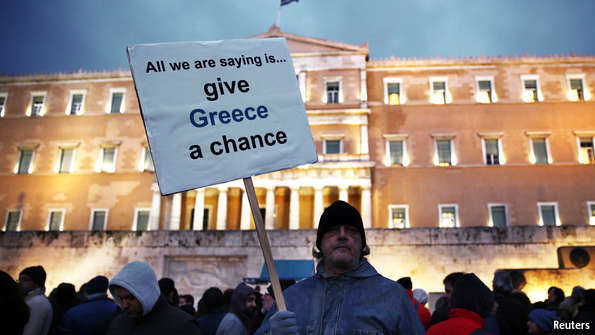 Greece has already restructured its debts once, in 2012. It now owes money mainly to other European governments, the European Central Bank (ECB) and the IMF. These official creditors have slashed interest rates and stretched out maturities, but not enough. With a debt stock of 175% of GDP, Greece will need more relief. Most European politicians quietly accept this. The danger lies in a chaotic default born of brinkmanship. The Greek government has bills to pay and no money to pay them. It is resorting to desperate measures. This week Alexis Tsipras, the prime minister, ordered local-government bodies to move spare cash to the central bank. That might buy a few weeks. But in the end Greece will not be able to pay its pensioners, let alone its creditors, without a deal with its European paymasters that unlocks new loans. Second, Europeans worry less today about the market consequences of Grexit. Thanks to the 2012 restructuring, the direct effects of another Greek default would be easier to handle because Europe’s banks, the weak link in any panic, are now more insulated. As fears of financial contagion have dwindled, so has European creditors’ appetite for compromise. And third, political constraints on both sides make bargaining hard. Syriza was elected on a promise to halt the endless austerity required by its bail-outs. The government has its own factions to control, among them hard-left MPs unprepared to make concessions on privatisations or pensions. Mr Tsipras might need a referendum or another election to win a mandate to backtrack even if he wanted to. Voters in creditor countries are tired of paying for Greece; politicians in places like Spain that have also been through austerity are hawkish. Repayments to euro-zone lenders are not due until the 2020s. But if you add all these elements together, it is hard to see how the Greeks can reach a deal that will let them honour their more immediate debts to the IMF and the ECB. Less clear is whether such a default must lead to euro exit. The two need not go together: Greece defaulted on private-sector creditors in 2012. But stiffing private investors with the support of the euro zone is quite different from unilateral non-payment to official creditors. The decisions of the ECB, which keeps Greece’s banks afloat, would be critical. The ECB does not want to be the actor that precipitates Grexit by withdrawing support; and ratings agencies have helpfully said that a missed payment to an official creditor would not constitute a default. But if the ECB itself were not being paid, that would be a hard line to hold. And non-payment would depress the value of Greek banks’ holdings of short-term government debt and encourage deposit flight. That would leave the banks needing more liquidity support from the ECB just when doubts about their solvency crystallised. The ECB is unlikely to help then. Slow economic growth, low inflation, and a cautious Fed can continue to reward stock investors. In early 2015 global financial markets continued to be buoyed by a combination of low interest rates, central bank liquidity and positive, albeit modest, economic growth. For some time we have been talking about the “Goldilocks” backdrop of slow growth, low inflation and low interest rates that has been very rewarding for financial assets. In general, our assessment is that the U.S. economy is well positioned to deliver several more years of reasonable, low inflation growth paced by a stronger consumer, a stronger dollar and weak commodity prices. Our expectation is that this outlook will prove to be supportive of equity markets over the next 12-24 months; however, we note that near-term, a stronger dollar coupled with sharply lower earnings for energy companies could lead to several quarters of lower earnings for the S&P 500 Index (S&P 500). The companies most likely to show near-term earnings weakness will obviously be those U.S. companies with large non- U.S. dollar revenues, as well as energy companies. It is possible that U.S. equities will react negatively to near-term earnings softness, but looking out to the back half of 2015 and 2016, we would expect further strengthening in the consumer sector of the U.S. economy to restore both earnings growth and investor confidence in the resiliency of corporate profits and the economic recovery. Plunging energy prices and a sharply stronger dollar have dominated the news so far in 2015. Both developments should help support U.S. consumer spending and contribute to keeping inflation and interest rates low. There is a near-term downside, however, to both lower energy prices and a stronger dollar leading some observers to take a more cautious stance on equities. This bearish view is predicated on the fact that the oil and gas industry in the U.S. has been responsible for a disproportionate share of U.S. employment and capital spending growth over the past three to four years. Now, the collapse in oil and gas prices over the past six to nine months is leading to a sharp contraction in exploration and development in every major energy-producing region in the U.S. This is leading to layoffs and an average 41% reduction in capital spending by oil companies. Our more constructive view is that while these cuts will dampen economic prospects in certain parts of the country, the U.S. economy overall should benefit from lower energy prices. Furthermore, if the dust settles in 2016-17, we think oil and gas prices will rebound from current levels and the U.S. energy sector will see renewed growth. Our best guess is that prices will rebound to a “new normal” level, down materially from the $90-$110 level that persisted in the 2011-2014 time period. The simple fact is that the world will most likely need new energy supplies over the next five to ten years. At these new normal levels, oil and gas prices should prove high enough for U.S. producers to resume increased drilling activity leading to production growth; but they should not stress the consumer and arrest the economic recovery. The other issue that continues to make headlines is the ongoing obsession the financial markets have with the timing and magnitude of the Federal Reserve’s (the Fed’s) rate hike. As with any issue, there are bulls and bears. The bears would argue that the current bull market in both stocks and bonds will come to an end with the first rise in the fed funds rate. Some bears would go even further and say that there is a risk that the Fed might both push the stock market into a major bear market and drive the broader economy into recession similar to what happened when the Fed tightened prematurely in 1937, however, after the initial sell-off, the markets actually did quite well in the years that followed. Our sense is that the current Fed is highly attuned to the risk of tightening too soon and too much. With inflation still low, the dollar strong, labor participation rates still low and housing starts far below historical levels, we think the Fed is unlikely to aggressively tighten any time soon. Rather, we expect the Fed may begin tightening later this year with very small increases at first. These first few rate increases will represent a measured attempt to restore rates to more normal levels without slowing the economy. If this proves to be the case, we think that we may see some short-term volatility in equity and fixed income markets, but the stock market is likely to shrug off the initial rate increases when they eventually do come. The timing and pace of Fed tightening will ultimately be determined by the strength of the U.S. economy and inflationary pressures. This brings us back to a focus on evaluating the fundamentals supporting continued growth in the U.S. In the U.S. consumer spending is responsible for close to 70% of gross domestic product (GDP) and hence plays a disproportionate role in determining the health and rate of growth of the economy. As we look over the past six years, there is much to be happy about as it relates to the U.S. consumer. In March 2009, the U.S. unemployment rate stood at 8.7% on its way to 10.0% later in the year. Today, the unemployment rate is 5.5% and is trending lower. There are also indications that Americans are starting to re-enter the labor force, which should drive the labor participation rate higher from the current low of 62.8%. In a related development, we’re seeing close to 4% growth in disposable incomes. Additionally, some of the largest retailers are announcing hourly wage increases and it is likely that other major employers of hourly workers will follow suit. As the job picture has improved dramatically, the consumer has also been able to borrow more. Last year consumer credit balances grew by 7% as compared to a decline of almost 4% in the recession of 2009. All in all, outstanding consumer credit balances (excluding mortgage debt) have grown by approximately 30% since the end of 2009. In fact, the decline in mortgage debt has allowed the consumer to borrow more for other activities, including education and consumption, without increasing his or her overall liabilities. And, of course, this credit is obtained by consumers at historically low interest rates. The U.S. consumer is also seeing significant improvement on the asset side of the ledger. Home prices and stock prices have rebounded off of their recessionary lows . To put all of this in simple terms: the U.S. consumer is enjoying a much stronger job market, has access to credit, has a stronger personal balance sheet (thanks to recovery in housing and stock markets) and is benefitting from lower energy and import prices. It is no wonder that consumer confidence has rebounded and remains at high levels. All of these positive trends for the consumer are happening against a benign inflationary backdrop. Wage inflation is low, at least for now. The velocity of money (as measured by M2), is also at the lowest level since the measurement began in late 1950s. Low velocity is associated with a non-inflationary environment. Recent increases in the value of the dollar and decreases in oil prices are also generally viewed as non-inflationary. It is important to ask what could bring this happy state of affairs to an end. Over the past six years, while the U.S. consumer was trying to delever, the U.S. government borrowed at a rate previously only seen during the world wars of the 20th century, leaving total U.S. debt to GDP at 102% compared to 64% at the start of 2008. Today, we are in uncharted waters with government debt high and interest rates extremely low. The Fed has purchased much of the debt that the U.S. government issued over the past few years as part of its Quantitative Easing (QE) programs. Regardless of who holds the debt, if interest rates were to move much higher and do so quickly, the interest expense burden on the U.S. government budget would rise materially, resulting in larger deficits. This could make it harder for the government to attract buyers of debt, which in turn could drive interest rates even higher. The resulting financial strain on government finances could lead to a credit crunch on both consumers and businesses. Tightening credit conditions and rising interest rates may also arise if markets perceive that the Fed is moving too slowly in the face of escalating wage rates. Finally, it is possible that further strength in the dollar in combination with slowing economic growth abroad could lead to such a severe deterioration in our trade balance that the economy could stall. We think this is an unlikely scenario given how small international trade is as a percent of U.S. GDP. Shifting to the stock market, the S&P 500 is trading at the higher end of its historic valuation range measured across a variety of metrics. It’s trading at a roughly 18x price-to-earnings (P/E) ratio (vs. its 20-year average of roughly 19x and 10-year average of 16x). Using the cyclically adjusted price-to-earnings ratio (CAPE), the market trades at 28x vs. a 17x long-term average. Adjusting, however, for the present unusually low interest rate environment and with the backdrop of benign economic conditions, the valuation of equities today appears more reasonable and actually could move even higher. Given that near-term interest rates are virtually at zero, the implied 5.5% equity earnings yield (the inverse of the current 18x P/E ratio) appears reasonably attractive. While this virtuous relationship between low interest rates and ever increasing equity valuations will probably not last forever, in an environment of continued slow growth and low inflation, interest rates are likely to rise only moderately and equity valuations may remain in the upper part of their historic range. Taking all of this into account, we remain vigilant as to the ever-present threats to capital while at the same time continuing the search for unusually attractive investment opportunities. We recognize the uncertainties inherent in any economic or market forecast and we are not betting the farm on any particular economic view. We continue to seek misunderstood and undervalued businesses with good or improving fundamentals; one company at a time. This is what we do in all markets, whether bull or bear. When Is The Next Great Bubble Burst? The big news of 2015 so far has been the so-called “earnings recession". 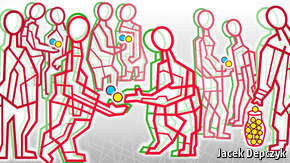 Understanding the market is as much about human behavior as the available financial data. Focus on keeping well informed, use that information to make sensible decisions. The top of the market is the same as any other part of the market: be weary of the advice of others on where the market is headed. When the market is reaching new peaks, it's human nature to tell you that it can only go down (well, assuming that we discount the "this time it's different" brigade). When the market has dropped considerably, you hear that it's bottoming out. Again, be weary. With the disclosure out of the way, let's look at how to best answer the question in a sober frame of mind. Firstly, in times when the stock market starts looking a little frothy, people turn to famed investor Warren Buffett to see what he has to say. In late 2014, onlookers were noting that the Sage of Omaha's "one best measure" to value bubbles (being a simple cross comparison between the stock market and GDP growth) was well above where it should be, pointing to a stock market bubble. Six months on in April 2015, however, and the same man gave an interview to CNBC. There, he told the interviewer that a bubble was quite some way off yet. However, he did note that there was very little cheap in the market right now. Basically, he's saying that the market isn't at nosebleed-inducing measures but that it's not quite at normal levels, either. It would be a brave or stupid investor that would bet against the (usually) wise words of Buffett. We're not about to, either. Well, with a caveat. When there's not much cheap in the market, it means that it's approaching bubble levels. Remember the phrase, "be fearful when others are greedy and greedy when others are fearful"? Right now, there are more greedy investors out there than fearful ones. If we take his "not much cheap" comment to refer to non-tech stocks only, and accept that tech stocks certainly aren't cheap in 2015 - then one thing is certain: there's very little value to be had in the market at the moment. Therefore, betting on anything going up by much more doesn't look wise. All that said, with so many tools currently available to investors (CFDs, options, etc. ), the question is perhaps a little too all-or-nothing. There's no need to make one-way bets on the market when you're leaving yourself prone to the whims of so many traders and investors. Hindsight tells us that if you're already reading articles about bubbles, then it's time to tread very carefully in the stock market. The truth is that it's less relevant exactly when the next burst bubble arrives as long as you've taken out sensible positions in your trades. From there, you should be fine, regardless of what day the next burst bubble falls on. Anyone looking to answer the above question should be commended. It's always a valid question to ask, regardless of the type of investment. It shows a degree of responsibility not always evident among more seasoned investors. Generally, we would recommend anyone asking themselves the question to see the advise of a peer-reviewed financial advisor. This is not an expense that should be scrimped on, either. Good financial advice will be worth it further down the road, while bad advice will come back to haunt you. Besides, the payment made to the advisor can effectively be written off over the lifetime of the investments they advise you to make. The truth is that everyone should invest the majority of their discretionary income in one form or another. This can be in education, the family home or other more orthodox investments such as stocks and treasuries. This isn't as outlandish a suggestion as it may first appear. Most people just leave money in a traditional savings account. That's generally fine but unless it's in a long-term savings account providing 5% per year, the reality is your money is loosing value over the long term. So much for the safety that a bank account provides you. Accepting that you should invest most of your money is the first step. The next question becomes: "what are my cash needs?" That is - what's your need for liquidity? Treasury bonds are considered as liquid as any investment (meaning you can cash out almost on demand). Likewise for the best corporate debt. Most stocks are pretty liquid too. But consider real estate - sure, a well-chosen piece of land or property will pay for itself over time, but how easy will it be to cash out in a day or two if your requirement for fast cash calls for that? Nigh on impossible. Next, your time profile should be taken into account. Most investments are made with a five-year timeframe in mind at the minimum but it varies. Young, forward-thinking individuals will often take on thirty year investments (a mortgage or college savings fund for their children being prime examples) while older people will tend to take on investments with shorter timeframes (unless they're trying to build a legacy or make investments on their children's and grandchildren's behalf). You can see the logic here: the timeframe will be specific to you but it is an important decision. Finally, the question, "how much money should I invest?" is best answered by, "it depends - how risky are the investments you're talking about?" This is the closest to a black and white answer you'll get here: you should never, ever bet the house - regardless of how safe the investment seems. Even the American government, home of the "risk free" bond, has gone bankrupt four times. Make sure you're well aware of the investments' risk profiles. We're not saying to avoid higher risk growth shares (to take one example), but be aware that with higher return, comes higher risk. By definition, the compound growth provided by good investments makes beginning to invest today better than doing it five years down the line. Likewise, the more you invest, the more that compound growth makes an impact. But be prudent. The advice we've given here is a primer at best and should be treated as such. Even the greatest investors hire their advisors and you shouldn't be any different. Where have all the trillions of newly created "money" gone? Into the failed and bankrupt banking scam conducted by the elites. All world-wide monetary policy undertaken by the central banks has been for the sole purpose of protecting the failed banking financial structure, propping up the fiat currencies. Ukraine could be thrown in, for good measure, but it has been serving a different purpose: the [failed] attempt to disrupt and gain control of Russia. Much of this has to do with a revised Great Game where the UK has been replaced by the US. Different players, on the surface, but both owned by the Crown Temple, based in The City, located in London but not a part of the UK, just as the District of Columbia is located in Washington D C but not a part of the United States. [Note: The Crown is not the Queen]. The United States is a corporation owned by the Crown since the formation of the colonies. It issues fiat Federal Reserve Notes [FRNs], which, as we have often stated, are nothing more than instruments of debt or liens. Debt cannot be money. The word debt has no fixed legal meaning, so we will call it an obligation to repay on a contract. Without getting too far afield, FRNs, as liens, is what ties US citizens into the IRS tax system. FRNs replaced the lawful United States Notes, which at one time were backed by gold and silver, in a bait-and-switch Ponzi scheme perpetrated by the foreign-owned [The Crown] Federal Reserve through the Federal Reserve Act of 1913. Early FRNs were also specie-backed by gold and silver when the Federal Reserve had them circulating along side US Notes. Gradually, US Notes were recalled and destroyed, and what remained in circulation were FRNs. During the joint circulation of US Notes and FRNs, the public accepted them as one and the same, the intended manipulation by the banking elites. The final nail in the specie-backed FRN was when Nixon closed the gold window on 15 August 1971, officially making FRNs pure fiat, backed by nothing but people's misguided imagination. 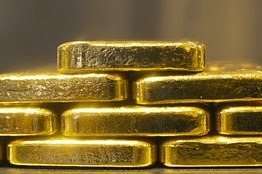 Gold and silver have always been the antithesis of fiat, and it is why central bankers have been actively manipulating gold throughout the 20th century. The FRN gained pre-eminence as the world's reserve currency, which means all trade conducted internationally was settled in FRN's, deceptively called "dollars." Through the process of being purposefully manipulated and dumbed down, via the bait-and-switch process we just described, everyone has come to believe that FRNs are dollars, and we recognize we are up against a tsunami of cognitive dissonance to get anyone to realize FRNs are not dollars, so we simply put them into parenthesis, "dollar." Now that the elite's fiat system is breaking down, the "dollar" has been rejected more and more by Eastern nations, Russia first and foremost, joined by China, morphing into the BRICS coalition, now being added to by the AIIB, [See China's AIIB Spells "Dollars" Demise], the US is engaged on its war mongering path of destruction as its last-ditch effort to preserve the totally corrupt and broken fiat FRN Ponzi scheme. This vain attempt to preserve the fiat "dollar" has been orchestrated by the elites, [Crown] all along. The horses are being switched from the Western-controlled fiat "dollar" to the soon to be introduced Special Drawing Rights [SDRs], a new and improved Crown-driven implementation fiat system to include Eastern powers, most the Chinese renminbi, aka the yuan. Along with the demise of the fiat "dollar" comes the demise of the corporate US as the world's dominating fiscal bully. Those in power are doing everything possible to stay in power, but that ain't going to happen. Eastern dominance is slowing pushing out Western dominance, but while the horses change, the riders remain the same hidden Crown Temple players that run the world. This is the Cliff Note version of why gold and silver have been Going Nowhere, [last week's article only partially distributed]. The necessity of preserving the Western "dollar"- denominated fiat currency system has been for the transition from the "dollar" to SDRs, and that is being carefully managed by the Crown. We addressed the topic of SDRs back in March, When Will PMs Rally? Not In 2015, which also has links to other SDR-related previous articles]. This is why we have stopped writing articles linking gold/silver fundamental-driven news and/or articles of the huge demand for both PMs, yet nothing begin translated into higher prices, all based on the voracious appetite for physical gold, the demand side, and trillions upon trillions of fiat flooding the central banking system supply side, neither one effecting the other. Hence, we continue to see the fiat-defying stagnating-to-moving-lower prices for both gold and silver. It is for these reasons we maintain primary focus on the charts because fundamentals do not apply, however much most people believe they do. How has that been working for the past four years? Trying to maintain a hand-to-eye coordination between interpreting the increasingly bizarre, mostly false reporting of news by the elite-controlled Western press is an exercise in futility. Last week, we said silver was going nowhere, and little has altered that assessment. The reason it is not necessary to know if silver will decline or rally directionally from here is because it would require a guess, attempting to "predict" the future, and no one can in these markets. Instead, it is better, especially for one's trading bottom line, to wait for the market to show a stronger likelihood of a move, which it will, and then make a determination to act on more concrete information that demonstrates a higher probability for an expected outcome. The last rally was weak, so there is no reason to buy into a weak market. Price may or may not hold on the increased selling volume, and that is a 50/50 assessment. A coin toss odds are not a higher probability trade consideration, so why act on inconclusive information? What we see as interesting is the large volume increase [effort], that did not lead to lower prices and a weaker daily close, and keeping activity in the upper half of the down channel. These observations have a more positive element in assessing them, but the trend is still down, and the trend is the most important consideration. Let the market confirm whether these developments are positive and will lead to a rally, or not. Why guess? On a relative basis, gold has been holding slightly better than silver. The gold/silver ratio had been running around 71:1, recently, and has climbed back to the 75:1 area. If the ratio can get to 80:1 or better, it would make sense to focus on buying silver over gold, for new purchases, and/or exchanging some gold holdings and switching them for silver. Reasoning? At 80:1, you get 80 oz of silver per oz of gold. When the ratio narrows, lets say to 40:1, it would take 40 oz of silver to buy 1 oz of gold. Buy switching 1 oz of gold for 80 oz of silver, one can now switch back from silver to gold and have 2 oz, without ever not holding PMs. To hold or not to hold support is the question. Wait and let the market declare itself. No guesswork involved = no risk in waiting. The country is once again running out of money. On April 24th euro-zone finance ministers are due to meet in Latvia to decide whether to provide a lifeline by disbursing the last instalment of the existing bail-out package. The problem is that Greece’s new government has refused to implement reforms promised by its predecessor, and has not proposed alternatives its creditors consider adequate. Talks continue, but the two sides remain far apart. 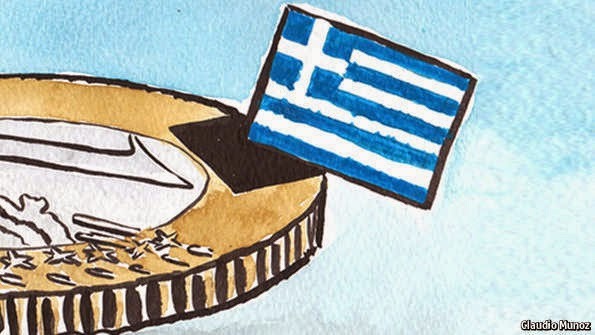 If Greece does not secure more cash, it will soon have to default either on its own citizens or on the IMF and the European Central Bank (ECB). That, in turn, could prompt the ECB to withhold support for Greek banks, forcing Greece to impose capital controls and perhaps to withdraw from the euro. All manner of financial indicators suggest disaster is imminent. The Greek government’s three-year bonds now yield a dizzying 27%. Ten-year government bonds are trading at their highest yields (and therefore lowest prices) since 2012 (see chart 1). Credit-default swaps, which offer insurance against a default, suggest an 80% chance of one within five years. Listed Greek firms are trading at less than 60% of their book value, on average. Greek bank stocks are down by 75% compared to this time last year. Betting house Paddy Power puts the odds of Greece adopting a new currency before 2018 at 5/4, of a new election being held this year at 3/1 and of Greece exiting the euro zone this year at 2/1. William Hill, another bookmaker, has stopped taking bets on “Grexit” altogether because too many people are putting their money on it. Just in case anyone still thought Greek debt was a sound investment, S&P, a rating agency, downgraded it to a lower category of junk earlier this month. All of which marks a change. In recent years Greece had seemed like the ideal destination for contrarian investors: in enough trouble that assets were cheap, but with the near-certainty that Europe would bail it out. In 2012 and 2013 hedge funds such as Third Point and Alden, among others, began hastily drumming up money to bet on a Greek recovery. Others followed in 2014 as foreigners ploughed more money than expected into local banks. John Paulson, who runs a feted hedge fund, was among those buying shares. 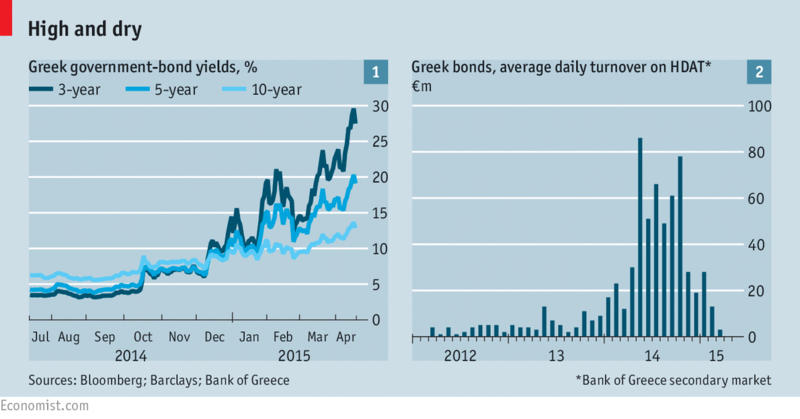 Last April, when Greece returned to the international market to sell five-year bonds, yield-hungry investors piled in. Even when Syriza came to power in January and markets wobbled, a few opportunistic investors increased their positions, convinced the difficulties would be temporary. Today few foreigners remain and most of those have trimmed their positions. After two bail-outs, only 11% of Greece’s government bonds are in private hands. Eaglevale, an American hedge fund whose Greek investments lost half their value last year, is now abandoning the bond market. After a flurry of interest in the run-up to the election in January, trading has atrophied (see chart 2). Analysts at big banks still hope for a compromise but concede that the odds are lengthening. A few investors, such as Japonica, another American hedge fund, are still convinced they will be vindicated, but most are hedging their bets (for example, by shorting Greek stocks) or are simply stuck because it is hard to sell in such an illiquid market. Some, like Mr Paulson, whose shares in Piraeus Bank are now worth a fifth of what he paid, are staying put and hoping for the best. But nearly all agree that their investments will prove either a bonanza or a wipeout. “Although compromise is still the most likely outcome, many Greek stocks and all of the banks are either trading violently cheap or are worth more or less zero,” argues Matthew Wood of Lancaster Investment Managers. Some even argue that Grexit would do markets good by frightening other countries into accelerating reforms, reducing support for protest parties such as Podemos in Spain and giving twitchy investors the confidence that the euro zone can weather such a crisis. The contagion to worry about, Mr Jabre reckons, would come from Europe caving in to Greek recalcitrance, giving other countries an incentive to follow suit. Government statistics are always suspect, for at least one obvious reason: Modern economies are way too big and complex to measure in real-time. So virtually every number is revised in the months after its release, frequently to the point of saying something very different. But by then lots of new data has come out and no one cares about the old numbers. The obvious explanation is that the dollar's exchange rate is way up, making US goods more expensive and foreign goods cheaper and leading the rest of world to buy less from us. Domestic factories are seeing their order books shrink and are as a result producing less. They're also hiring fewer and/or firing more workers. And the downtrend seems to be gaining momentum. Core orders in particular turned down in mid-2014 and are now in free-fall. Since the rest of the world isn't likely to start buying larger quantities of US trains, planes and automobiles anytime soon, the trend probably won't reverse without a favorable change in the terms of trade. That is, the dollar has to go down before US factories will pick up. And that won't happen while the Fed is promising to raise interest rates (which would, other things being equal, boost the dollar). So this looks set to continue until the Fed springs a surprise. And the longer that takes the bigger the subsequent reversal.